In Apache Flume, an event contains a header section and a payload. The header section is basically a map of properties whereas the payload is just a byte array. Let’s take a look at the Event interface class. * @param headers Map of headers to replace the current headers. * Sets the raw byte array of the data contained in this event. * @param body The data. 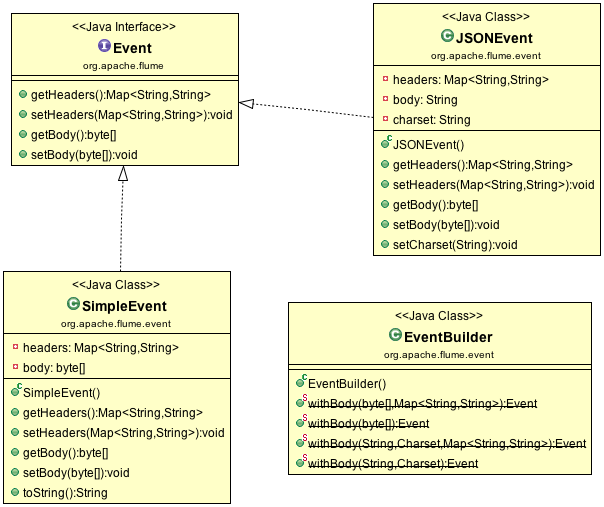 Both SimpleEvent and JSONEvent are the implementations of the Event interface. You could choose to use either one that fits your use cases. You could also use the EventBuilder class to create Event. One could create a RPCClient using the RPCClientFactory and start sending event to remote agent or AvroSource.